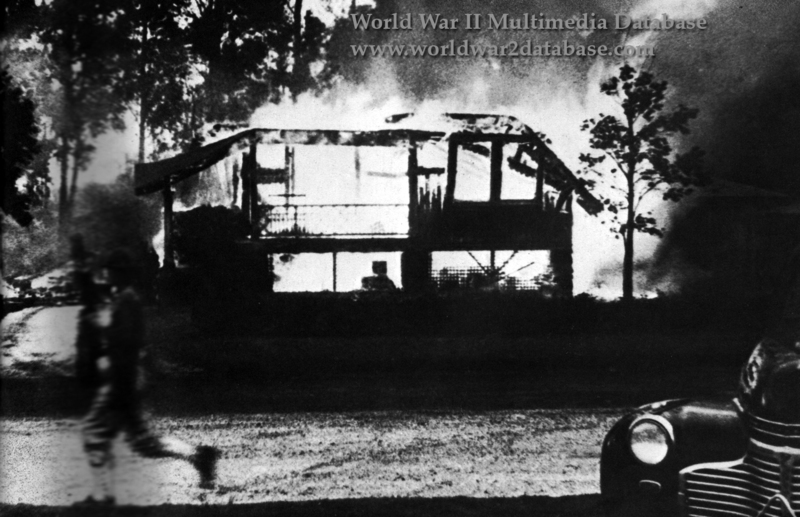 A civilian building in Honolulu burns after shelling by United States Navy anti-aircraft guns. Shells hit at Iholena and Judd Streets, Nuuanu Avenue, Fort Street, Kineau Street, McCully and King Streets, Kukui Streetand Kamanaki Street. One Japanese bomb hit a civilian area in Honolulu, probably in error. Strafing deaths were at Ewa Plantation, Pearl City, Waipahu, Red Hill, Pier 31 in Honolulu Harbor, Wahiawa, Dowsett Addition, and John Rodgers Field, a civilian airport.